Preparation More or less 90 min. Clean mushrooms with a small brush, cut off hard under part and slice. Sprinkle rabbit pieces with salt and flour. Melt 100 gr butter in a frying pan, glaze finely chopped onions and remove from pan, fry the bacon cubes and remove from pan. Add the rest of the butter to the pan, heat and fry the pieces of rabbit on all sides. Turn down the heat to the lowest point. Add bacon cubes, onions, bay leaves, thyme, two bottles of Barbãr blond and the stock and allow to stew on a low heat for 75 minutes until ready. Turn over now and then. Reduce gravy about 10 minutes before the end of the cooking time. Add the mushrooms and continue to cook. Remove bay leaves and thyme and season to taste with salt and pepper. When nearly ready, add the jam and mix well. 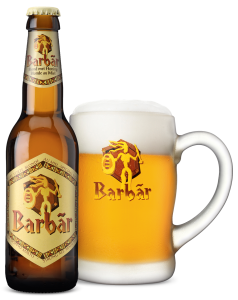 Serve with crispy potato croquettes and braised chicory accompanied by a nice cold glass of Barbãr Blond.